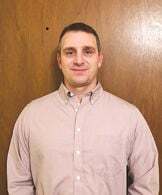 Kyle Curtis is the newest member of the Chariton School Board. He was appointed to the board to fill a vacancy left by the resignation of former board president Dave Rich at a special meeting Jan. 3 and he sat in on his first regular school board meeting Jan. 14. Curtis was born and raised in this area and attended Russell and Chariton schools growing up and graduated from Chariton High School in 1993. He explained why he wanted to be on the school board and said that he wants to run for a full-term when Rich’s term expires in 2021. “I wanted to be involved in the decisions that are being made for our schools and the students. I also have three children that are currently in the Chariton School District and one that will start preschool here next year,” Curtis said. Curtis and his wife, Kelli, live in Chariton and have been married since 2002. Kelli works for SCICAP (South Central Iowa Community Action Program) in Chariton. They have four children which include son Quenten, 15, who is a sophomore at Chariton High School; daughter Alivia, 13, who is in seventh grade at Chariton Middle School; daughter Aubree, 9, who is in fourth grade at Van Allen Elementary; and daughter, Jaicee, 3, who will start preschool this coming fall. Curtis likes the make up and members of the current school board along with Superintendent Larry Achenbach. “No decisions can be made unless we all agree as a board. We want to make sure our students are getting adequately prepared for their next steps in life whether it’s from preschool to kindergarten, middle school to high school, high school to college or from high school to some work field. One of my biggest personal goals is to make sure our kids are being prepared for the next step in life to succeed. We don’t want anyone to fall through the cracks,” Curtis said.